I don't think I've officially come out on the blog yet, but...I went vegetarian six months ago. Remember when I did the Vegan for a week thing last year. Well, I did that because I wanted to see if I could do it. If I could eat meat-free while also preparing food food my carnivorous boys. As it turns out, I can! But it has it's challenges. Some nights I'm cooking two meals at once. Other nights I'm eating only salads and side dishes. I'm learning the ropes of alternative proteins. I was a vegetarian during my teen years, but my parents cooked all of my veggie meals for me, so I came into this not knowing what quinoa, tempeh, and lentils were and/or how to cook them. I have to say my favorite of these three so far is quinoa. It's so versatile, healthy, affordable, easy to prepare and yummy! You can keep cooked quinoa in your fridge to throw in spaghetti sauce, sloppy joes, salads and the one I'll share with you today...chili! I wanted to make Chili my way. I have been perfecting my Chili recipe for years now and I wanted to transform this recipe into a meatless option. It's very easy to have two batches of this recipe brewing. One with ground beef. One with quinoa. 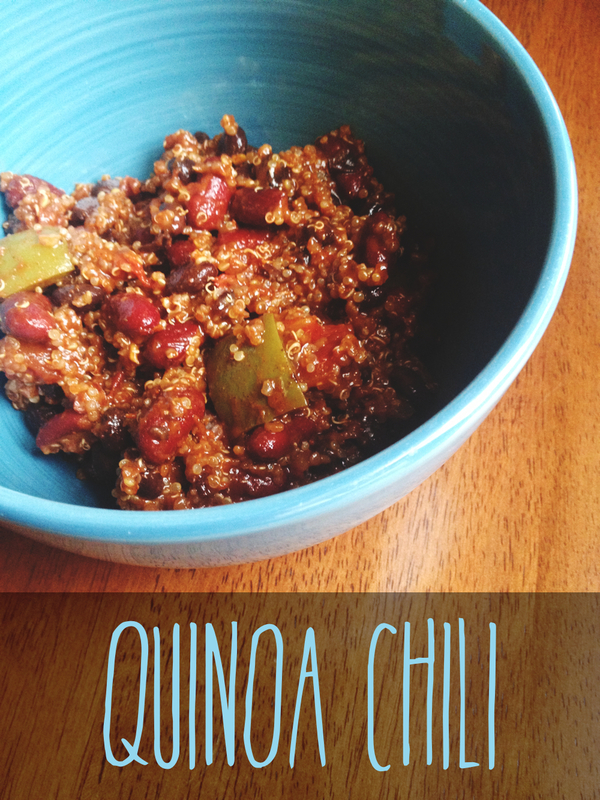 And if you are NOT a vegetarian, this chili is hearty and delicious. You won't miss the meat at all. Prepare the quinoa as it says on package. You usually want two cups of liquid per cup of quinoa, and I have found one cup of quinoa translates to about 1lb of ground beef. In a large pot on med-low heat, transfer quinoa (with any remaining liquid). Add seasoning, tomatoes, bell pepper, and jalapeño. This recipe will be dryer than your traditional chili. It will get soupier as it heats. You can add broth or tomato sauce if you'd like (a little at a time). Simmer on low heat for at least 15 minutes, but like any chili, the longer you let it sit on low heat, the tastier it will be. Just be careful, don't let it burn. After the peppers are soft, add the beans. Make sure to drain & rinse black beans or you'll have black chili. Last, add the crushed red pepper. This is optional, but it just adds another element of heat. As for the jalapeño and red pepper, you can adjust those to your taste. I like it spicy and this was pretty spicy. Garnish with sour cream, cheese, chives, crackers, corn bread or serve over macaroni like I do. Oh I will have to try this while T is there at Rucker. He's super picky about his meat. He gets annoyed with me buying ground turkey. "Its just not the same..." Ha! Also, I've taken a mini break from reading blogs. Not sure when you redid your layout but I loooove it! I love your about page. Very cute! I LOVE quinoa!! I made 2 different dishes featuring quinoa this weekend so I'm eating them all week. I have lots of yummy recipes using quinoa, lentils, tofu...all vegetarian. Let me know if you want some of them. I made quinoa, lentil and black bean chili last year. It was really good! This looks good! I'm not a huge fan of hamburger meat, so I often make chili vegetarian style. I am pinning this! Sounds hearty and delish. Yum I LOVE quinoa! I am adding this to my Pinterest food board now!